Rabbits are herbivores that eat only plant-based foods; among their favorite foods are leafy weeds, forbs, clover, crunch vegetables and grass. Rabbits live a grazing lifestyle and consume a lot of hard-to-digest matter, including cellulose. Special digestive adaptions allow the rabbit to redigest expelled droppings to derive the most nutrition from the foods it eats. 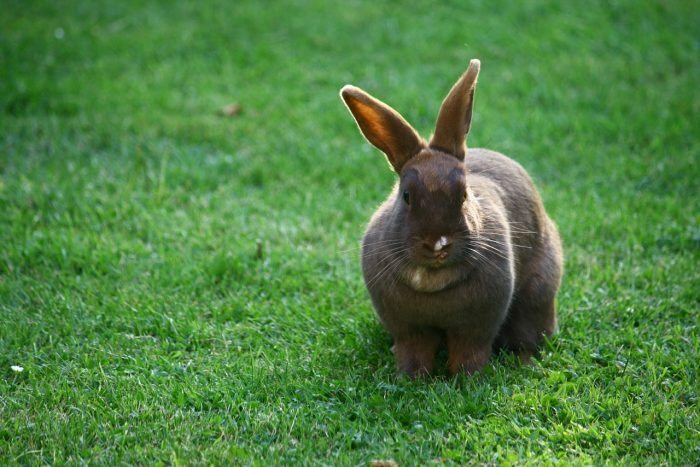 The rabbit’s diet changes with the season and may differ by region. In winter, the rabbit’s diet shifts to bark, twigs, buds, confider needles and bark as well as any remaining green plants. Notably, the rabbit passes two feces types: regular hard droppings and soft pellets known as caecotrophs that it immediately eats after dropping and extracts additional nutrients from.